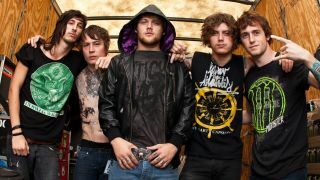 Former Asking Alexandria singer Danny Worsnop says he’s planning on visiting his old bandmate Ben Bruce in Arizona. Now Worsnop says he’s planning a trip to hook up with the guitarist to perhaps play music together – which drew a humorous response from Bruce. Worsnop is concentrating on his solo career while Asking Alexandria continue to support fourth album The Black – their first album with frontman Denis Stoff – with a North American tour starting next month.